A domestic abuse charity has developed a new app that helps people who are in abusive relationships to keep track of incidents. It looks like a lifestyle app and allows the victim to record information such as the date, location and images. The information then disappears from the phone and is stored remotely online, where it can only be accessed by the user with a code. The Cithrâh Foundation developed the app with funding from Comic Relief. "If you're in a domestic abuse cycle, it just keeps going round," said Catherine Harper, the charity's founder. "Because of trauma you forget what's happening or what has happened. "You're not aware of dates and times, trauma knocks all that stuff out of your head. "It tends to take over your whole brain." Liz Gibbons, a former police officer, helped Cithrâh to develop the app. She said: "The idea came from my history in the police, just going to the same households many times and seeing the challenge it was for victims of abuse to record their story. "In the mayhem, sometimes it can be a blur, especially after many months and many years - it's hard to document every incident and keep a clear picture." One woman who has used the app but wanted to remain anonymous said: "I was in an abusive relationship for over 10 years, I spent every day walking on eggshells. "He made me feel - and also told me - I was worthless. "When I finally got enough courage to leave with our kids, he was abusive towards our kids. "I've found the app really helpful - it's an easy way to record incidents big or small, if I or the kids have contact from him." She added: "I used to record this type of stuff in a little book, which I lost and all my evidence of what had happened to me and the kids was gone. "It's so safe, even if you are still in a relationship with your abuser they won't suspect that you're keeping track of what's being done to you. "It's good to write it and get it out of your system and for your own peace of mind. "If later on down the line your abuser makes you doubt yourself, it's there in black in white that it did happen and you're not losing it." The Police Service of Northern Ireland (PSNI) recorded its highest ever figure for incidents of domestic violence in Northern Ireland in the 12 months leading up to September 2018. Between 1 October 2017 and 30 September 2018, there were 31,008 domestic abuse incidents recorded. That figure was the highest since records began in 2004-05. On average, police officers respond to an incident every 17 minutes. "We welcome any initiative which highlights the issue of domestic abuse," said the PSNI. We have not included the name of the app for the safety of those using it. 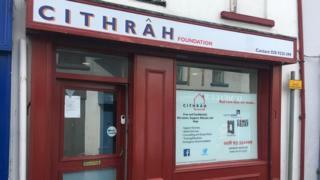 If you wish to download it, get in touch with the Cithrâh Foundation by email or on Facebook.